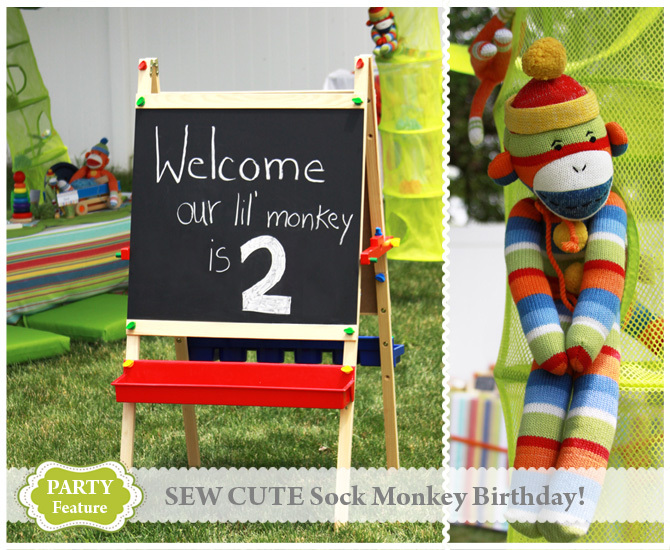 CELEBRATE: SEW CUTE Sock Monkey Birthday! 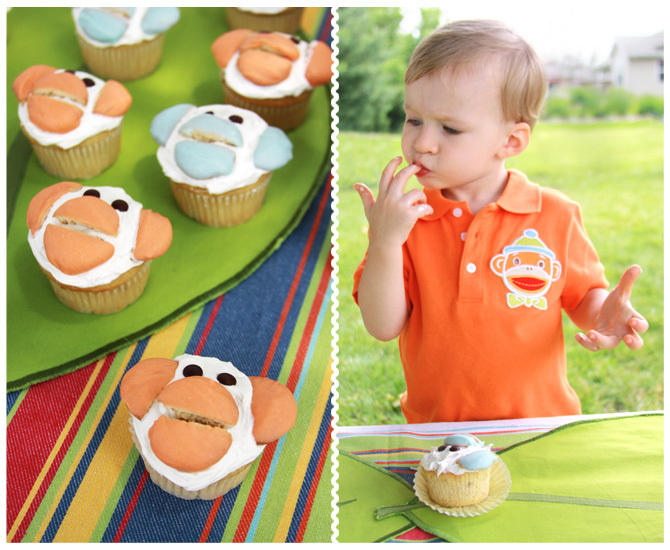 The theme for my son, Allen's 2nd Birthday was obvious. Before he was born, I went shopping for his welcome home gift. I found an adorable lil' stuffed monkey and a matching blanket that was the softest fabric I had ever felt. I nicknamed him and his toy - "lil' monkey". Now that lil' monkey has become his best buddy and follows him everywhere. I started by researching my party theme online and results popped up for sock monkeys, but I wanted to stay away from the traditional brown sock monkey. 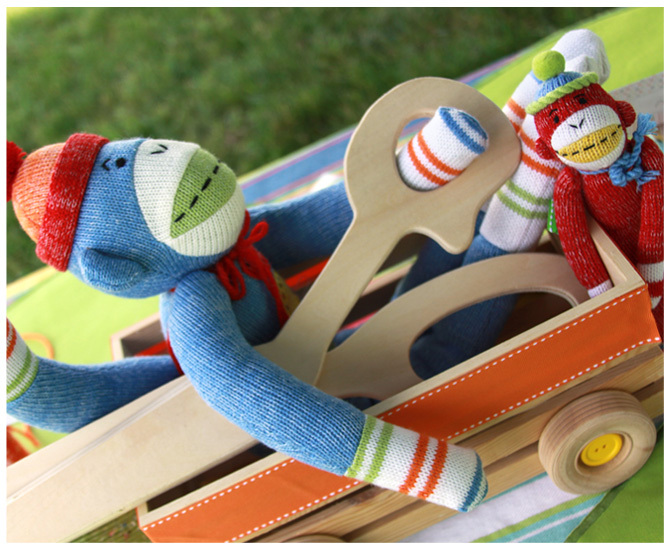 Then I came across these bright and colorful monkeys called Genuine Monkeez by Midwest CBK. 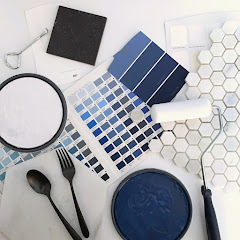 Each one is unique with their own name, color scheme and accessories. Their sizes vary from teeny tiny to larger than life. Ooo Eee Ahh Ahh... I was so excited! DIY Tip: To make the "#2 BUTTON COLLAGE SIGN" - Using a pencil, draw a number onto foam board or cardboard, then carefully cut it out. Then hot glue layer after layer of buttons in various sizes in a random pattern. 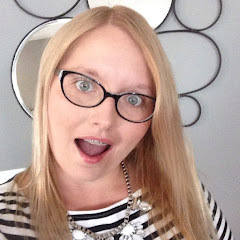 Tie the top with a ribbon to hang it! 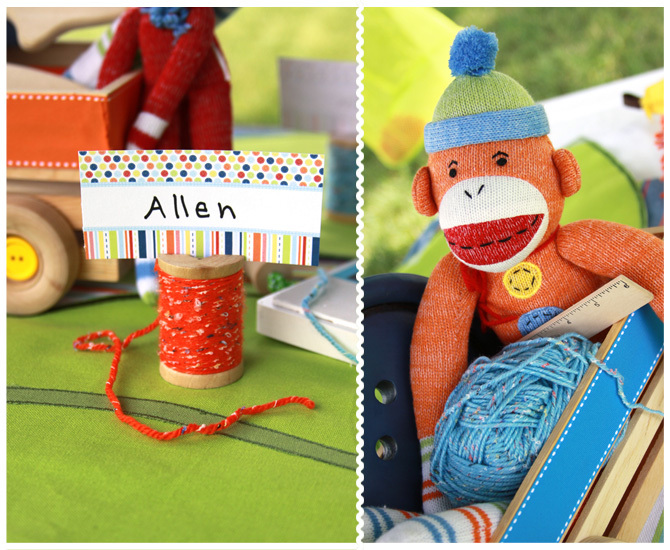 Since sock monkeys originate from craft materials, I used yarns, buttons, scissors, rulers, spools, ribbons, etc. as decorative accents throughout the party. 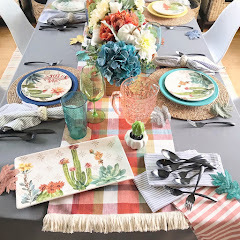 Leaf shaped fabric placemats ran in a line down each side of the table. Multi-striped fabric shower curtains were used for tablecloths. Chair cushions were on the ground for comfort. 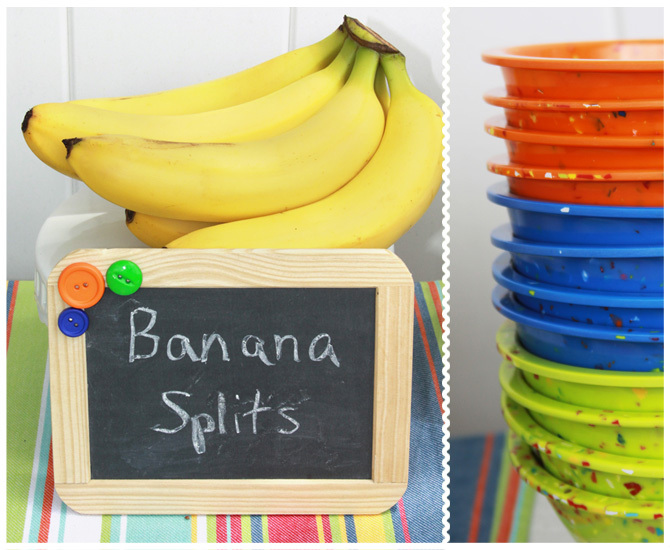 Monkey cups were made from construction paper by using circular paper punches, a hole puncher and scissors, then glued around clear plastic cups. 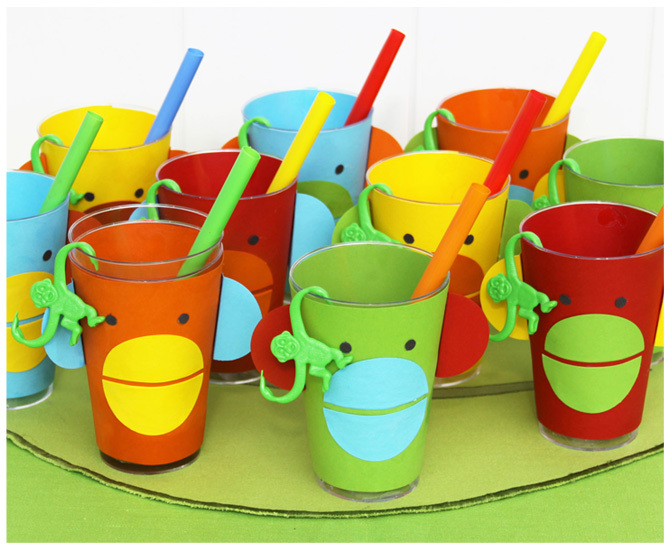 Large colorful straws were placed in each cup along with a single "Barrel of Monkeys" toy hung on the edge. These were easy to make and looked ADORABLE! 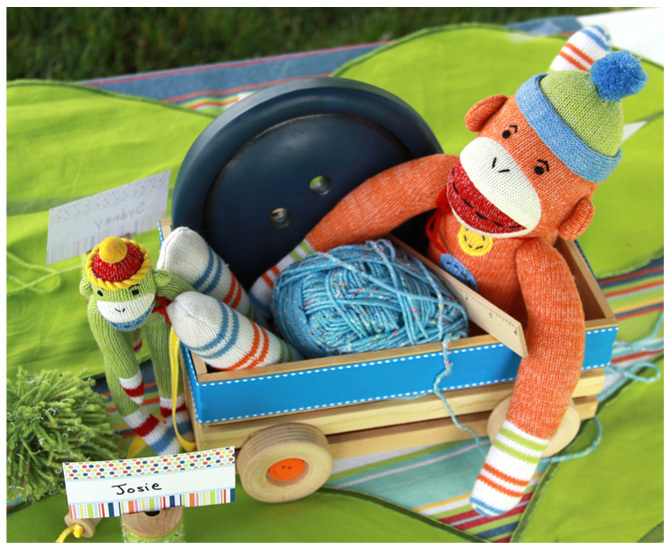 Down the center of the table were two wood crate wagons with a sock monkey in each one and a large ball of yarn. A wood ruler, big wood button and large wooden scissors were also placed inside. 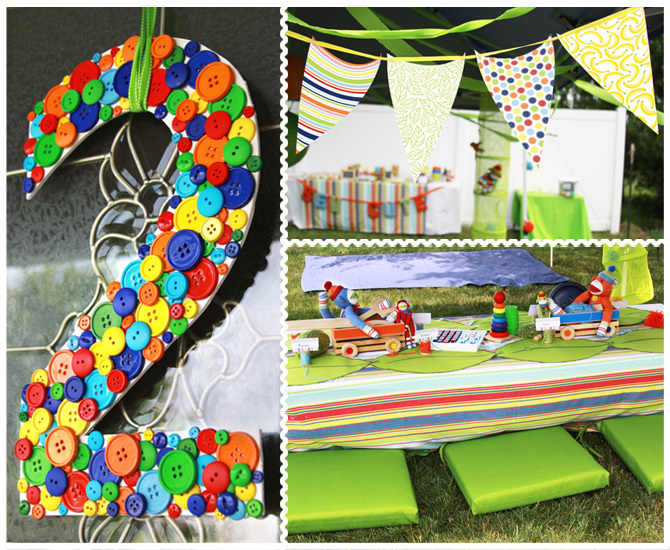 Place card holders were created from wooden spools, yarn and custom printable place cards. 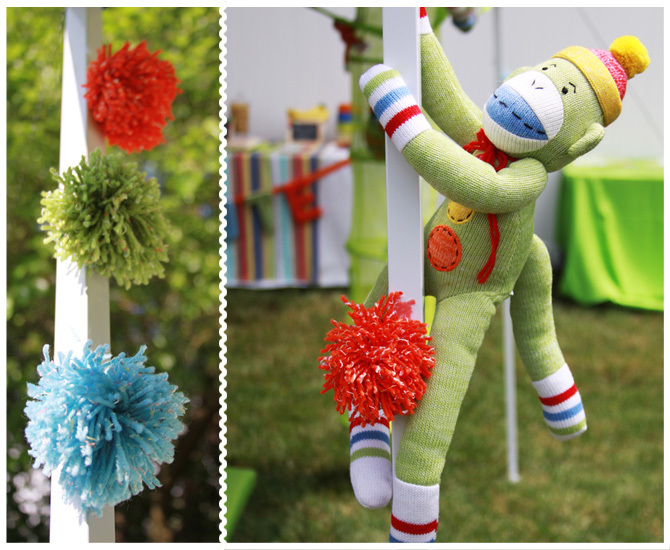 Handmade yarn pom pom's were put on the table, taped to the tent poles and tossed inside the hanging mesh toy organizers. 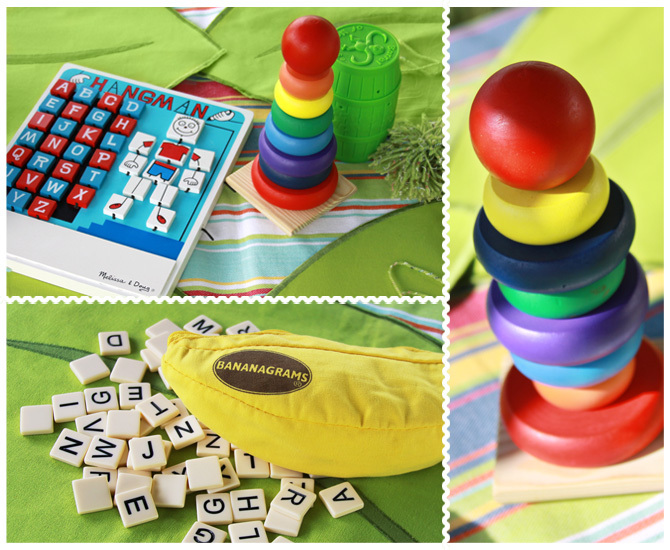 Toys such as stackable rings, Hangman, Barrel of Monkeys and Bananagrams were also scattered not only for decoration but also for extra activities. 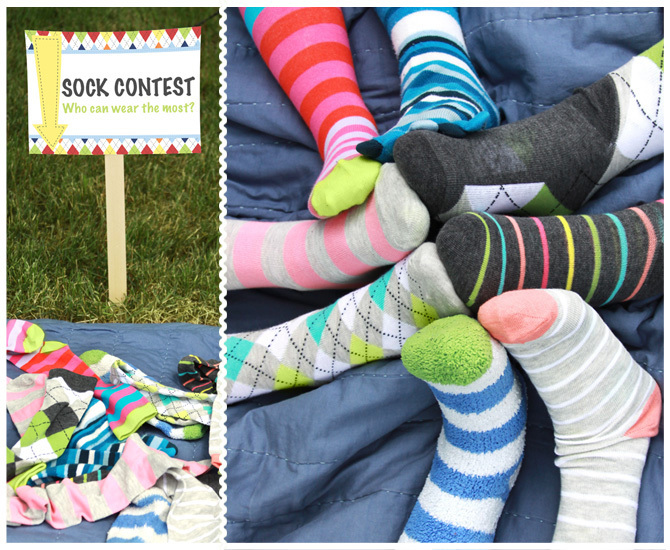 Sock monkeys were hung up-side down, right-side up, side ways and every which way all around the tent. 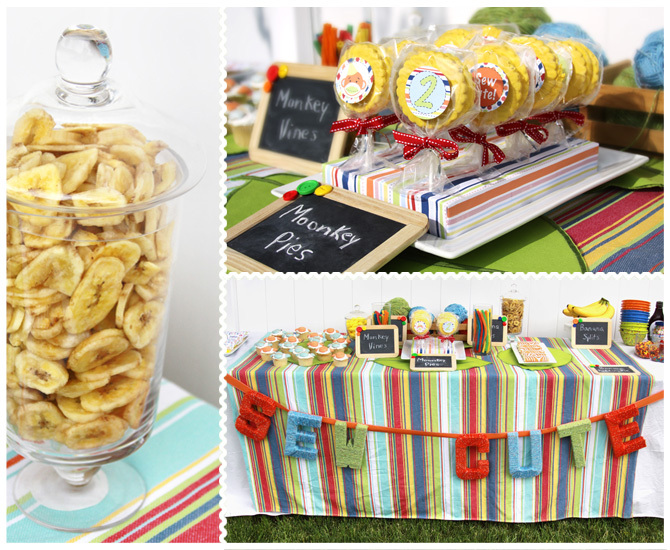 Draped across the front of the dessert table were yarn wrapped cardboard letters that spelled "SEW CUTE" and hung from ribbon. 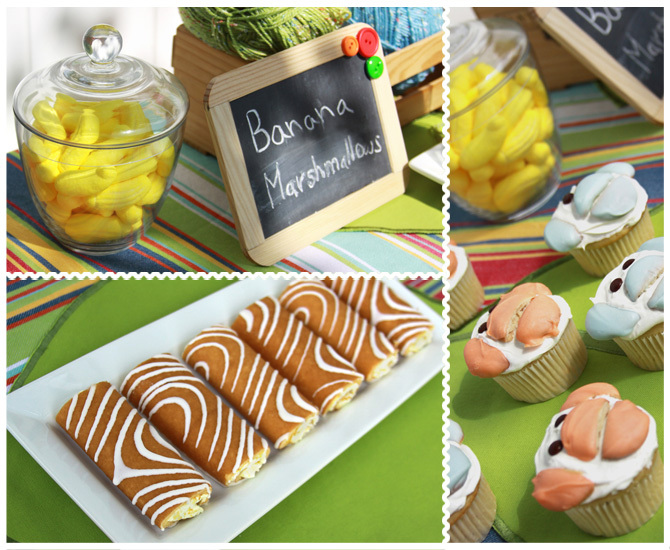 Dessert ideas were easy for this theme... just GO BANANAS! Moonkey pie pops (Moon Pies), monkey vines (licorice), banana cakes, banana cream pie, banana chips, banana marshmallows and banana cupcakes of course! The banana cupcakes (recipe inside "Hello, Cupcake!" book) had whipped vanilla frosting and vanilla wafer cookies dipped in chocolate to make monkey faces. 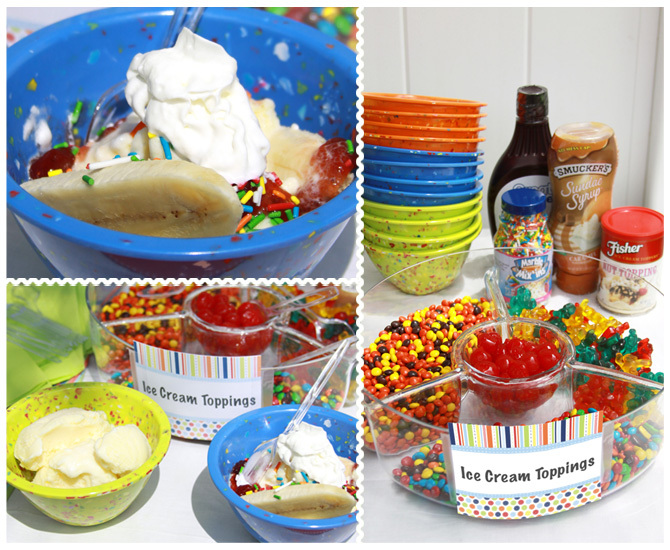 The banana split bar was a guest FAVORITE with homemade vanilla ice cream, fresh bananas and lots of toppings. 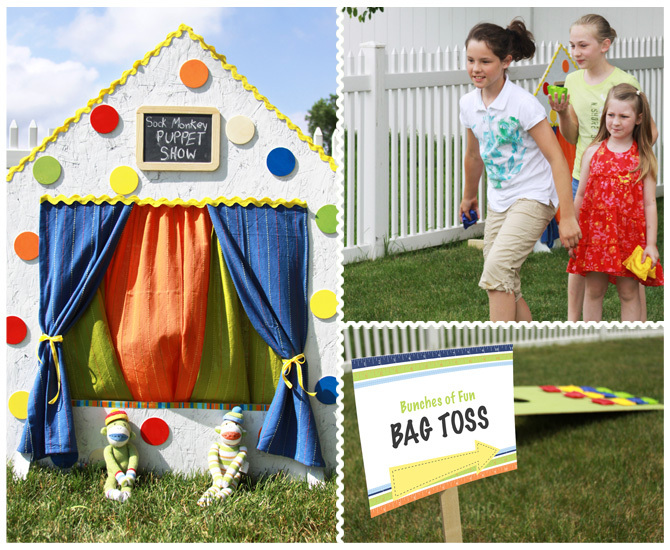 Activity ideas include a MONKEY mask craft project, BUNCHES of fun bag toss, create your own SOCK MONKEY, BANANA box car race, SOCK wearing contest and a SOCK MONKEY puppet show! 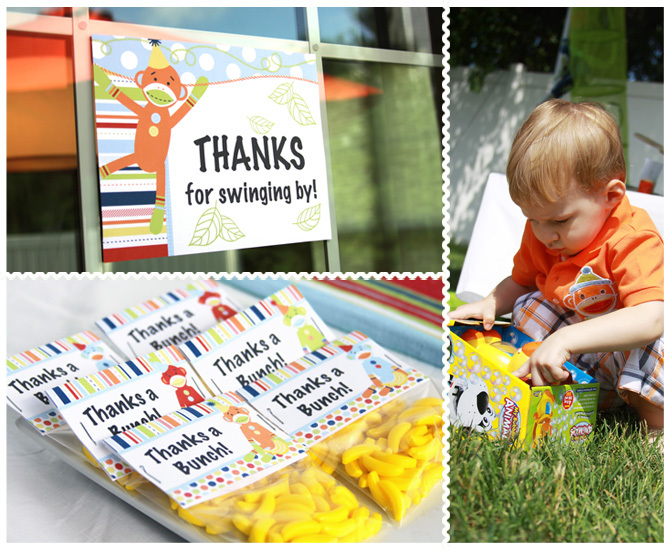 As each guest exited the party they received a small party favor bag with banana candies that included a label saying - "Thanks a Bunch!". 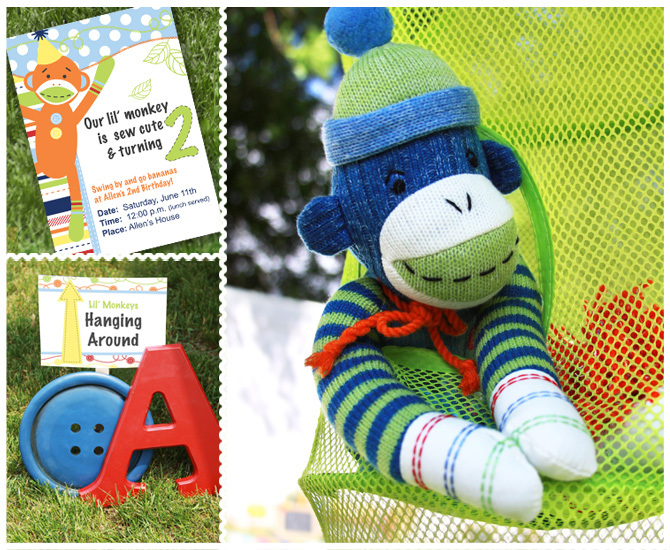 The children also got to take home a polka dotted gable box filled with their personally decorated handmade sock monkey, sock monkey key chain, monkey magnet and a tiny Barrel of Monkeys. A circle tag was tied to the outside that said "This Belongs to:" so that each child would know which one was theirs. Thanks for SWINGING BY! 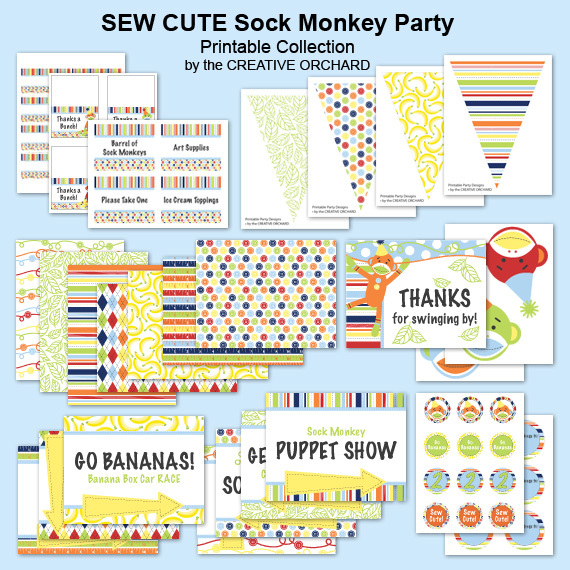 Printable party designs: SEW CUTE Sock Monkey collection available in the Creative Orchard Shop!